Akabeko leaned forward with interest, for once without a single criticism for the healing strategy Hadakha was describing. He had always been a strong healer with good instincts, but after training with the guild he had developed a complete personal philosophy and and the healing intuition to boot. She enjoyed their discussions now more than ever, since there was less of a student-teacher dynamic and more of an equal exchange of ideas. The doorbell she had rigged up to the doorway buzzed, emitting a sound like an irate planestrider. "Sorry," she muttered to Hadakha, going to the door. Two burly orcs were waiting outside, both wearing blood-red tabards depicting Hellscream's sigil. "By degree of Garrosh Hellscream, all in service to the Horde are to swear an oath of allegiance to their Warchief," the first orc announced without preamble. His beady eyes flicked to Hadakha, who had followed Akabeko to the door. "All Horde members to Grommash Hold to swear allegiance to the Warchief," he repeated. Akabeko's face twisted in incredulity. "I beg your unbelievable pardon?" Her next words were cut off by Hadakha's fingers digging into her forearm. "What she means is: we'll be right there." The orc wrinkled his nose in distaste and regarded them scornfully before finally motioning for the other grunt to follow him. Hadakha pulled Akabeko along behind them, directing them towards Grommash Hold. Akabeko placed her hand over where Hadakha's still rested on her arm and squeezed in irritation. To his credit, Hadakha did not flinch. They shuffled along behind the orcs, arm in awkward arm. Inside Grommash Hold, more guards were arranging newcomers into rank and file. Each marched forward, declaring allegiance to the Warchief group by group. Garrosh presided over this with a grim satisfaction, nodding sternly to each group as it passed. The two tauren allowed themselves to be herded into line, Akabeko still scowling and keeping a vicegrip on Hadakha's hand. He didn't look particularly happy about the turn of events either, but was at least resigned to it in the interest of self-preservation. The Warchief's eyes were upon them. Tongue feeling clumsy in her mouth, Akabeko brought a fist to her breast and spoke the orcish words pledging her service not to the Horde, but to the Warchief personally. "It's not my language; it's not my true heart," she thought traitorously to herself. The chorus of voices echoed in the hold, then died away. They moved away to make room for the next group. Akabeko glanced at Hadakha balefully, but he was focusing on something over her shoulder. She turned to look. General Nazgrim, a high-ranking, particularly surly orc officer, was pulling soldiers aside and quietly handing them small rolls of parchment. His eyes met Akabeko's, then raked over her and Hadakha's tabards. He flicked his chin, indicating for them to join them. He pressed scrolls into each of their hands. "I have need of an elite veteran force for a preliminary excursion into new territory. Everything is explained in the scroll. Do not be late." With a last curt nod, he shooed them back into the crowd and out of the hold. Hadakha stepped off the road into the relative shade of a scraggly bush and tore open the scroll. "Pandaria?" he muttered softly. A week and a half later, Akabeko found herself blearily stowing her travel gear in the small bunk she had been assigned on the zeppelin and running over the checklist she had received upon reporting for duty. Fortunately, she had been put on mess hall duty. Her last deployment had her in the latrines every other day of the journey. She made her way through the lower levels of the zeppelin, mapping the layout. Suddenly, she recognized an unexpected face by one of the murky windows. "Long time no see, Wei!" Akabeko made her way through the increasing bustle towards the pandaren monk. She touched her heart in greeting. Weipon seemed surprised, but also relieved to see her tauren acquaintance. "Aka! What are the odds?" "You tell me! I was under the impression that this was a veteran force, and didn't you just arrive in Orgrimmar?" Weipon shrugged. "I've been conscripted as a translator. They don't know if the pandaren living in Pandaria will understand Orcish. 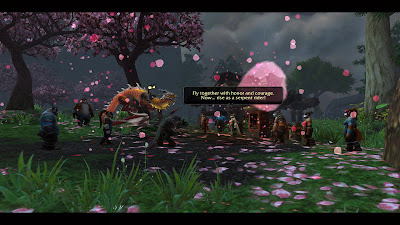 Besides, the guard told me that we pandaren needed to prove ourselves if we wanted to stay in the Horde." Her mouth quirked wryly. Akabeko hummed sympathetically. "Lately I get the impression that anybody in the Horde is expected to start 'proving' themselves." She took in Weipon's silk shirt with an apprehensive glance. 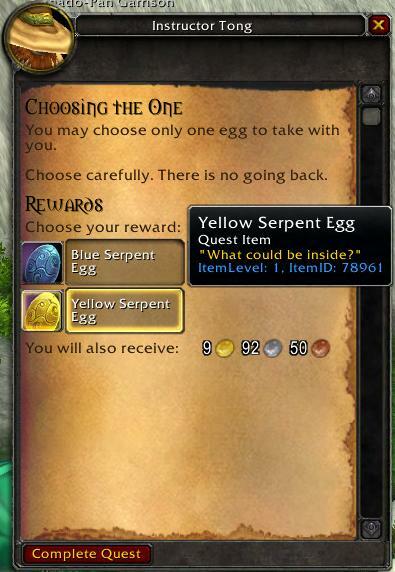 "Do you have, um, something a little more protective to wear when we get to Pandaria? It's not going to be all sunshine and rainbows, if it goes anything like my other campaigns." "Oh, I have my gear stowed away for now. I've been assigned to mucking the wyvern roost, anyway." She pointed to a bundle resting beside a rucksack and what appeared to be an instrument case on a nearby bunk. Before Akabeko could ask about the long-necked instrument, the rucksack moved, then let out a soft bark. Her eyes widened. Weipon coughed. Somewhere above, a horn announced their imminent departure, and the quiet hum of the engines increased as the engineers prepared to shove off. Soldiers streamed around them, looking for vantage points from which to bid farewell to Orgrimmar. "You know, just tell me later. For now, I know a pretty good spot we can wave goodbye to the city from." Akabeko tried not to glance at the rucksack again, although it now appeared to be chasing its own tail. She followed the other soldiers out of the barracks, then pushed her way through the packed, window-lined hallways to a small platform. It was situated close to the enormous propellers at the back of the ship, and very windy, but it provided a panoramic view of everything they were leaving behind. The zeppelin began to float away, and a cheer went up from those aboard. Akabeko and Weipon waved to Orgrimmar as it became smaller. "Bye, new house. Bye, Ji," Weipon said. #ffw Serenaded by the lovely Karegina! It was dark as Karegina winged her way through the Vale of the Eternal Blossoms towards the Shrine of the Two Moons. A lot had been on her mind these last few days and she knew that Winter Veil was upon them. She'd had big plans for one of her friends, Akabeko, but those plans ended up falling through because she lost her voice. She shifted into cow form as she flew through the Shrine of the Two Moons' archway and she headed straight towards portals in the Imperial Mercantile. Popping through the portal into Orgrimmar, a song snuck into her head, something she'd heard as someone flew in from Arathi Basin one day. She remembered that her original plan was to find her friend Akabeko and sing all her overheard Winter Veil carols to her in person. But that didn't work since she lost her voice. She remembered the original singer was a very angry orc but she had thought the songs would sound good with her husky tauren voice. She willed herself into bird form and flapped her wings, lifting herself off the ground and heading towards the tree that Great Father Winter had erected near the flight master and riding trainer. As the giant tree came into view, she remembered all the good Winter's Veils she'd had under that tree, or a similar one. Last year, she remembered running into her sister Annanda shortly after Annanda had her mind transferred from an undead until a goblin. She remembered the year before when her love, Paliclaus, gifted her with a elixir of the sands so she could turn into a giant dragon. (Every druid really wants to be a dragon ya know.) And the years prior, she remembered laughing with her best shaman friend, who started as a tauren, then had her mind transferred to a troll, then to a goblin. 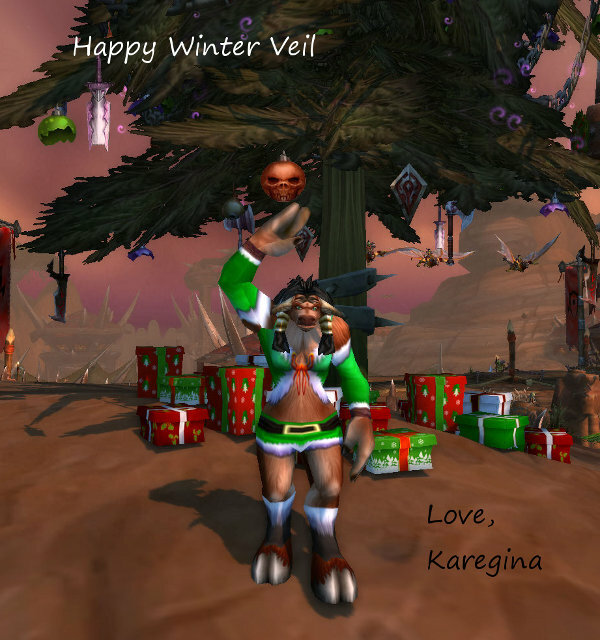 Winter Veil has always been Karegina's favorite holiday. Durotar never got cold, but it got cooler during this time of the year and felt a little more the Mulgore. Which brought to mind another song she'd heard from an angry orc. She'd heard it as he was returning from a Eye of the Storm battleground. She always heard the funniest things as people returned from battlegrounds. Karegina flew around the tree a few times before spotting Akabeko standing before Tatepi, the banker. She landed, pulled on her gaudy singing sweater and started singing the rest of the overheard carols. She took a deep breath for a trickier carol and started in again. With that, she shifted into bird form and flapped away. My gift to you today is a gif of me playing 超・ちゃぶ台返し aka "the table-flipping game." The link should give you an idea of what it's like to play. Most of the fun is the slow-motion replay of your destruction. In even better news, I just found out there's an app for it. Happy holidays, my darlings. I was so caught up in what I would do for the gift I am preparing for my #ffw recipient, that I'd totally forgotten I would be receiving something too! Imagine my confusion when this landed in my inbox.....Kamalia? How the hell did she get my email? What could she wa - oooooooooohhhhhh. I can't thank her enough for this wonderful addition to the storyline that Akabeko and I have been weaving! I can't speak for Aka (though I am quietly confident that she feels the same(Aka: YES)), but I am thrilled to have others contribute their talents, characters, and headcanon to our little fanfic project. This Winter Veil gift story fills a hole in my timeline that I just could not find ideas for, and I could not have asked for a more perfect gift! Thank you, Kamalia! And a merry Winter Veil to all! 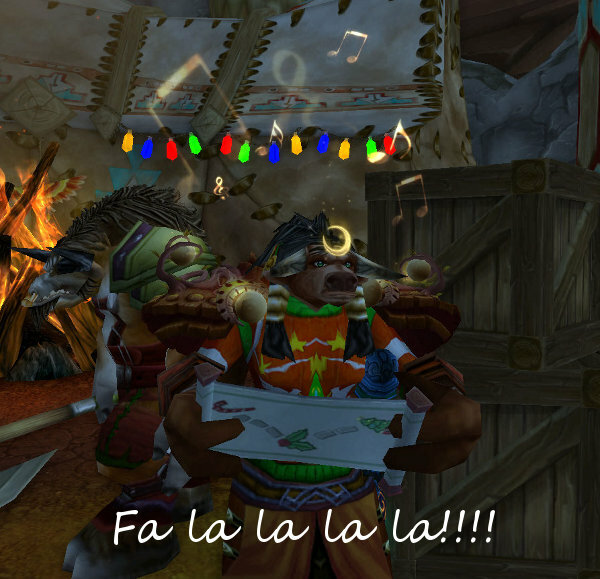 A very merry Winter Veil to you, Dahakha! I don't know what you have planned for your story, so if this doesn't fit in with your plot, feel free to add a disclaimer about it being "non-canonical" when you post it. A deep voice roused the shaman from her meditation, and she lifted her eyes, blinking, from the fire to see the dark silhouette of a bull in druid gear looming in the doorway of her tent. Finishing the traditional Taur'ahe greeting to a respected Farseer, the stranger bowed to her. As her eyes adjusted, she saw the gold-capped tips of the bull's own horns peeping out from a blue leather hood adorned with massive antlers, and the glint of the firelight reflecting off of his eyes. She could not make out much else of his face. "How may I help you?" she asked, gesturing her visitor to seat himself on another of the rugs around the firepit. "I have been told that a... friend of mine, whom I consider to be trustworthy, has great regard for your insights and opinions. I have recently returned from a sojourn in Outland, and I find things much changed, in ways that I do not fully understand." "You seek a vision, then?" the shaman inquired. "What is it you wish to see?" The druid hesitated, drawing in and letting out several deep breaths before he answered. "There are events, people, that my friends and associates do not seem to remember in the same way I do. I would like to know whether it is their memory that is confounded... or mine." "That is not an easy vision to request of the spirits," the shaman replied. "Do you have any objects that may serve as a lodestone for their search?" Nodding, the druid reached into his pack and withdrew a lockbox. "I left this chest in my vault before I departed for Outland. When I returned, it was not in my vault, and I was... disturbed by where I did, at last, find it." The shaman took the box and examined it carefully. Her eyes widened as she recognized the faint scent clinging to the carved wood as the smoke from funerary herbs. "This will not be an easy vision to request," she repeated. "A place of power will be required, and I must focus my own soul. Meet me at dawn tomorrow morning at the entrance to the Pools of Vision." The grey light of very early morning was just beginning to turn rosy when the shaman arrived at the mouth of the caverns that riddled the interior of Spirit Rise. As she looked around, the sleek shape of a druid in cat-form materialized out of the shadows, then shifted smoothly into a bull wearing an antlered hood and blue feathers on his shoulders. Wordlessly, they went into the caves. Out of long habit, the shaman cast a baleful glare down the passageway where the Forsaken coven practiced their dark magics. Seeing the druid's questioning look, she muttered, "I don't understand why the Forsaken weren't cast out of this sacred place after Magatha," -- she practically spat the name -- "who first sponsored their coming here, was exiled." The druid shrugged sympathetically. "There are many, many things about the administration of the Horde these days that I do not comprehend. Perhaps this vision will help me make sense of some of them." They made their way to a small chamber as far from the corrupting influence of the Forsaken as possible. Phosphorescent mushrooms lit the cave with a glow that was softened and diffused by the mist hanging over the shimmering surface of the pool that took up most of the floor. The shaman carefully set up her totems in the corners of the dry space. Taking the lockbox from the druid, she placed it at the very edge of the water. "Kneel here," she instructed the druid. "Clear your mind of all but your queries, and gaze into the water." Then she began to chant, invoking each of the elemental spirits in turn, and then the ancestral spirits who watched over Thunder Bluff from the Red Rocks. The surface of the pool quivered, began to bubble, and then wavelets rippled up to lap around the lockbox as the elements responded. "Now we must watch and listen," the shaman said quietly as she finished chanting. The mist thickened until the druid could barely see anything beyond the box; he could locate the shaman's totems only by their colored glows. Suddenly, the mist cleared, the surface of the pool became as smooth as glass, and in its stillness, the druid saw. "I filled up an extra water jug-"
"-and someone should be by around lunchtime to check on you-"
"-and of course I'll bring dinner home with me." The tauren huffed irritably from his throne of cushions. "You went over all of this last night. It's not like my memory was injured." "Yes, well," the orc frowned. "I need you back in fighting form as soon as possible. Going to work by myself is boring." "You work shifts opposite mine all the time when we don't have a project!" he protested. When the orc ignored him in favor of adding another blanket to the frankly alarming pile of things he might need "just in case," he flopped back against his pillow and sighed noisily. "I'm going to go completely mad being cooped up like this." The orc glanced at him disbelievingly. "You're welcome to read any of my books." He snorted. "Animal anatomy textbooks and every issue of Chainmail Monthly do not a library make." "Fine!" The orc threw up her hands, grabbed her keys, and went to the door. "I'll get something more appropriate for you. Perhaps a book of tauren fairytales." 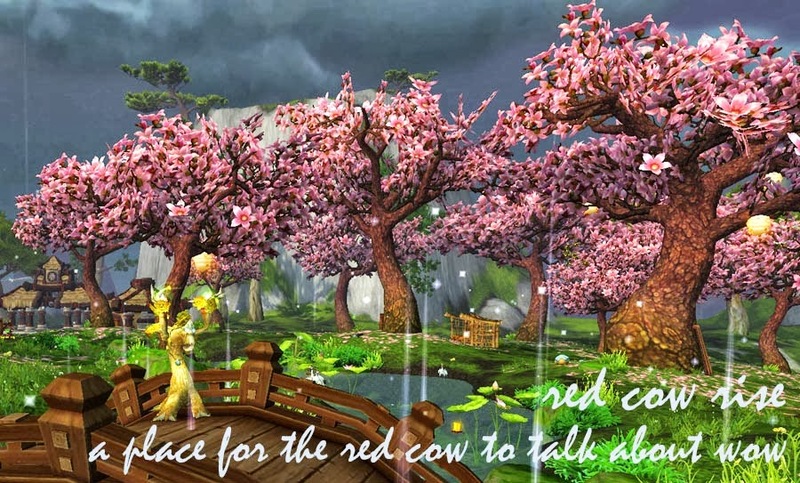 "Tauren do not have fairytales!" he shouted at the slamming door. It was true that they didn't always work alongside each other when they weren't working on a specific set of gear. But the orc normally didn't spend her solo shifts worrying that her partner had managed to fall on his cracked ribs or bump his bruised head. Now she was frowning over a shoddy piece of novice work, unable to find any redeeming feature, unless the wearer for some reason had one leg half a foot longer than the other. The shop bell tinkled and she looked up, eager for any distraction. A grey-furred, grey-maned tauren stepped inside, looking around shyly. She clutched a familiar parchment in one hand. The orc stood, inviting the tauren to come and sit at her worktable. The tauren unfurled the parchment across the desk. "I'm here on behalf of the Earthen Ring. We're looking to commission a set of new chainmail for the Pandaria exploratory forces..."
The orc leaned over the specifications, scanning the parameters quickly. "Ahh, this is shaman gear, isn't it," she said unnecessarily. "That's right," the tauren agreed. The orc muttered possible materials and locations quietly to herself, drawing a finger down the parameters outlined in the document. The tauren looked on with obvious interest. With a sigh, the orc sat back heavily. "I'm afraid to tell you, Ambassador..."
"Kamalia," the tauren supplied. She seemed surprised by the orc's sudden change in mood. "Ambassador Kamalia, I'm afraid to tell you that although there are several leatherworkers in this shop that specialize in blacksmithing incorporated into leather, neither I nor my partner are qualified to do this kind of work. I would offer to canvass potential materials and send them to another leatherworker to craft, but my partner was injured on our last assignment and isn't fully recovered, so I can't even do that." The orc grimaced. Kamalia made a sympathetic noise. "I'm very sorry to hear that." She peered more closely at the orc, evidently putting some rumors together. "So, you mean that I could get the materials from one leatherworker, and then have a different one craft the gear?" The orc nodded. "But you can't, because your partner is out, and you can't work with anyone else?" Something in the orc's cheek twitched. "No, I'm afraid not." "Oh, well, all right! I understand. So...I should go somewhere else?" Kamalia asked pleasantly. The orc sighed with obvious displeasure. "Yes, as much as I want this commission, Ambassador, I'm afraid the best I can do for you is to refer you to one of our sister workshops. Of course, our guild is committed to providing only the highest quality work, and as such I'll give you the name of the best mail armor specialists in town." Kamalia smiled. "That would be very helpful! I'm afraid I haven't done this sort of thing before, so I simply asked around my friends for workshops..."
The orc smiled. "Well, I'm glad they gave you our name. Give me just one moment; I'll bring the shop information and a token you can use to show that we referred you." "Yes, as I recall, not only will they give you a referral discount but there is a special deal for commissions from the Earthen Ring..." She slipped through the privacy curtain cutting the back room off from the main work area. Two apprentices were working on studding a large pile of belts. One of them, a troll employed for less than half a year in the workshop, was in the middle of ranting to the other. "I heard that he was beaten up by a night elf!" The troll continued. "And do you know why he became a leatherworker in the first place? He used to be a hunter, but his pet died..."
Her eyes unfocused in quickly mounting rage. "...and he was so sad that he quit right then and there!" With a snarl, the orc seized the troll and slammed him against the nearest wall. He struggled, spluttering and indignant, when her forearm pressed dangerously against his windpipe, then immediately went still when he felt the pinprick of a knife just under his ribs. The other recruit, a soft-spoken forsaken, had practically fallen out of her chair and now hovered uncertainly just out of the orc's reach. The shop owner, who had been surreptitiously snoozing at his desk, was now looming apprehensively over the pair. "How dare you speak about your better in such a way. You shouldn't even be allowed to think about him!" she snarled, resisting every urge to plunge the knife home and twist. Somewhere in the back of her mind, a very quiet voice repeated that this reaction was definitely more than was called for. A large hand landed firmly on her shoulder, both a comfort and a warning. "All right, then," the Master Leatherworker said. He tugged gently at her, and she reluctantly released the troll. In response, the troll rolled his shoulders and made a show of not being terrified. "Frankly, we shouldn't even have to have this conversation," the shopkeeper told the troll calmly, "but you don't go speaking ill about your coworkers, especially ones who have been putting themselves in unbelievable danger to protect their partners for longer than you've been legally allowed to use juju. You're off the rotation for the month, and I hope you spend all that time with no pay thinking about how I could justify letting her gut you for such comments. Get out." He folded his thick arms and watched the troll slink out the door with a grimace. Then he turned to the orc. "As for you...are you all right? Should you even be here right now?" The orc sniffed. "I'm fine, as long as I can stay away from fools like that." They sized each other up for a moment, then the larger orc shrugged his shoulders. "Whatever. As long as you don't kill anybody...well, as long as you don't kill anybody who doesn't deserve it. I'm gonna go get some lunch. Try not to slaughter any customers while I'm out." The orc returned to Kamalia, who had waited, face stiff in wary politeness throughout the entire interaction. "Listen, do the tauren have any sort of fairytales? I need to get a friend a gift." #ffw Furtive Father Winter participants! Emails have gone out! If you have not received an email from me about your gift recipient, or if you have any comments or questions, please reply here/use my contact form ASAP! Now the fun begins: please investigate your recipient's blog to see if it gives you any gift inspiration! Then, by December 31st, email them a gift post to publish! Here are this year's contributors! I'm so pleased to see old and new faces, and I look forward to everyone's posts! Akabeko (red cow rise) from Karegina! Effraeti (Awaiting the Muse) from Cymre! Kamalia (Kamalia et Alia) from Kialesse! Cymre (Bubbles of Mischief) from Herculano! Stubborn (Sheep the Diamond) from Carmelo M! Amerence (Amerence Love WoW) from Delgadita & Kamalia! Karegina (Ysera's Daughter) from Lib Feathers! Navimie (The Daily Frostwolf) from Dahakha! Draccus (A Druid's Doodling) from Delgadita! Typhoon Andrew (Eye of the Storm) from Garrosh Hellscream! Incinderella (Incinderella's Fashion Emporium) from Noahdeer! Noahdeer (Be MOP) from Oathblade! Draynee (Pretty Fly for a Draenei) from Tyledres! Nightwill (Info about WoW from the Altaholic) from Kaliy! Lib Feathers (Fanfiction by Lib Feathers) from Incinderella! Dahakha (*this will be hosted on red cow rise) from Kamalia! Carmelo M (Clever Musings) from Amerence! Jennifer (Escapist Scrawl) from Typhoon Andrew! Arvash (The Crimson Hammer) from The Godmother! The Godmother (Alt:ernative) from Stubborn! Kaliy (The Casual Everythinger) from Jojo! Garrosh Hellscream (The Warchief's Command Board) from Akabeko! Jojo (Admiring Azeroth) from Xsinthis! Xsinthis (The Golden Crusade) from Arvash! Herculano (Herculano Unchained) from Navimie! Weipon sank down onto the only chair in her small lodging. She was exhausted, but within minutes she was up and moving again, attempting to unpack the few belongings she had brought with her to Kalimdor. Fu snored quietly by the door, curled up in a prime spot to watch out for his master's safety. Weipon could hardly remember the rapid turn of events that had led her from a simple martial arts tournament to leaving her homeland via hot air balloon in order to join one side in a long and bitter war. Travel by hot air balloon seemed like a great idea at first, until seasickness, the need for privacy, and general boredom set in. Ji had made sure that Weipon slept at least a few hours during the trip, but she didn't feel rested by a long shot. They had finally reached Kalimdor and been escorted into the Horde capital city of Orgrimmar. The current Warchief, leader of both the orcs and the other races of the Horde, had given them a very long and rather menacing speech. Weipon had only understood about half, but she couldn't miss the barely-restrained violence in Garrosh Hellscream's demeanor. Warchief Hellscream had ordered some of the pandaren to fight against some creatures being held captive in the city. Ji had made Weipon sit out, which seemed like a good idea as soon as she got a look at the monsters. Even the exposure to such a small host of different creatures had thrown her for a loop. Her textbooks seemed woefully lacking, now! And there it was. The jumble of painful and agonizing feelings she had been ignoring for the sake of practicality. It was overwhelming - Master Shang's death, while she watched, while she couldn't do anything; killing real, living and breathing creatures with the skill she had practiced since she was young that was supposed to be fun but now it was murderous; leaving her parents, the only home she had ever known, the only culture she had ever experienced, on a half-formed whim, and now she was alone in a strange room in a strange city on a strange continent and everyone was speaking too loudly and in too many languages and she was just so exhausted...! The nervous energy dissipated. Weipon sat down and began to cry. She woke to a firm knocking on the door and Fu nudging urgently at her cheek. Groggily, she stumbled to the door. It felt like she had swallowed sand, and her face felt puffy and unfamiliar...oh, right. The inevitable crash after too much excitement. She opened the door. Ji was waiting, poised to knock again. He shifted this gesture smoothly into a jaunty wave. "Morning, Ms. Silkbrush. Thought you might not have had a chance to get any grub, so I brought over a little something. As a housewarming gift, you could say." He held up something wrapped in paper. It was currently oozing grease, turning the paper clear, and smelled strongly of garlic. She accepted the curious offering, and had to start again to make her voice come out clearly. "Thanks, Ji. Would you like to come in? I'm afraid I haven't done much to the place yet." 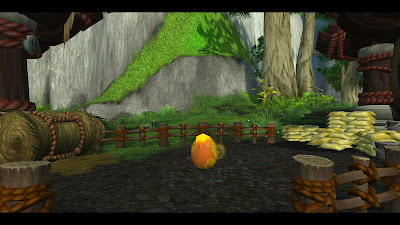 He followed her inside, glancing around and confirming that it was identical to the other pandaren quarters. Fu came over to investigate, so he patted the animal gently while Weipon bustled around, looking for something to serve followed by something to serve it with. Eventually, Ji was presented with tea, hastily brewed and served in a cup Weipon sometimes used to wash her brushes in. Weipon sat on a stool and unwrapped the greasy food Ji had brought. She found what appeared to be a massive bird's leg, although she did not know what animal it could have come from. It had been fried to a crispy black. Hesitantly, she took a crunchy bite and found it to be palatable. Ji watched her eat approvingly for a moment, then began to speak. "Listen, Weipon... There's going to be a lot going on in the next few weeks as we figure out how we fit into the "Horde war machine." He said this with some distaste. "I'll be doing a lot of administrative work since I've somehow become the official representative for the Horde pandaren. But I'm setting up some activities: martial arts training, meditation, even some culture classes for the other Horde races. You're welcome to teach, or just attend as a student if you'd prefer. I just don't want you to be too out of sorts. It's important to have some friendly faces when you go to a new place." Weipon was silent for a moment. She hadn't expected Ji to notice, or even care if she had trouble adjusting to their new home, and now felt overcome with affection for his gesture. "I really appreciate that you stopped by. I think I will try to visit your classes, and if you need instructors, I'd love to help. Once this place is livable, I'll need to get out and get my bearings, I guess." He nodded, looking slightly relieved that she didn't want to talk about anything too deeply. "Well, I look forward to seeing you in our little slice of Orgrimmar. If you don't see me, I'm sure you'll recognize one of the other students and they can give you whatever you need." He stood, returned his half-drunk tea with a smile, and showed himself out. "Take care of yourself, Weipon," he said seriously, just before closing the door. Alone again, Weipon decided to make use of the morning she was now awake to appreciate. After arranging her belongings in the chest at the end of the bed, she set about arranging the various mementos she had brought from home. Recipes went onto the small shelf above her tiny hearth fire. The sanxian was placed opposite from the fire, as far away as it could go. She laid out her calligraphy materials on a low table in the same corner. Then, with great reverence, she hung the notes she had gotten from each of her parents on the wall. It was comforting to have a piece of each of their writing. She could see her mother's straightforwardness and affection in the bold strokes of the character she had written. In her father's piece, she clearly read his lightheartedness in the flourishes of each character. Thinking about them brought her back to the sad memories she had made before leaving the Wandering Isle, but it was easier to recall them that it had been the day before. Eventually, she pulled her confidence together enough to venture out in search of groceries. The nearest food market was a loud, bustling mess of loud customers and even louder vendors, each trying to bark their wares over the din. The sudden presence of a pandaren trying to unobtrusively buy vegetables turned heads and started hushed conversations all around her. Weipon tried not to hunch her shoulders, instead asking shopkeeper directly, in Orcish, which cut of pork she recommended for soups. The troll replied, made the transaction, and complimented Weipon on her accent while wrapping her purchase. Bemused, Weipon moved on to search for fruit. At home again, she stored her groceries and prepared a small meal for herself. She hadn't forgotten Fu, either, and delighted him with an entire fish cooked in a wonderful-smelling sauce. With hours to go until bedtime and feeling restless, she decided to go out again. This time, her aimless wandering took her into what was labeled on her map as "The Drag". This shady thoroughfare connected several of Orgrimmar's districts together, and as such was busy at any time of day or night. Now, Weipon followed the more sedate evening crowd through the wide street, turning her head this way and that to catch all of the different sights. She herself was one of them, as she caught people doing double- and triple-takes at the pandaren in their midst. Finally, a sign above a tavern caught her eye. A smiling male pandaren was holding an overflowing stein underneath the words "Brewmaster's Barrel." With a wry grin, Weipon stepped inside and was immediately assaulted with a blast of warm air and boisterous laughter. Several patrons looked up in surprise at her entrance. She made her way to the bar and had a seat next to two trolls engaged in a very deep discussion. The bartender appeared shortly, grinning widely at Weipon. "Well! I had heard that we had pandaren in our city now, but you're the first to grace us with a visit. What'll you have? The first one's on me." "Oh, um, thank you!" Weipon replied, sitting up a little straighter. "What do you recommend?" The plump tauren winked and held up a finger, which Weipon recalled could mean "wait" or sometimes "number one." She returned with a stein filled to the brim. "This is a personal favorite, the Long Stride Brew from Drohn's Distillery. Locally brewed, well-known, and very popular." Weipon took a sip. "Oh, it's very good! Thank you." The bartender smiled and moved away to attend to other customers. Having heard her speak Orcish, a willowy blood elf sitting nearby leaned over. "So when did you guys get here, anyway?" "Just a few days ago," Weipon replied. "We are in the Valley of Honor, if you'd like to go and learn about our culture." "Is it true that all pandaren can kill a man with just two fingers?" Weipon blinked. "Uh, no. I don't think so." The blood elf arched one thin brow, then abruptly turned back to his drinking partner to report this factoid. 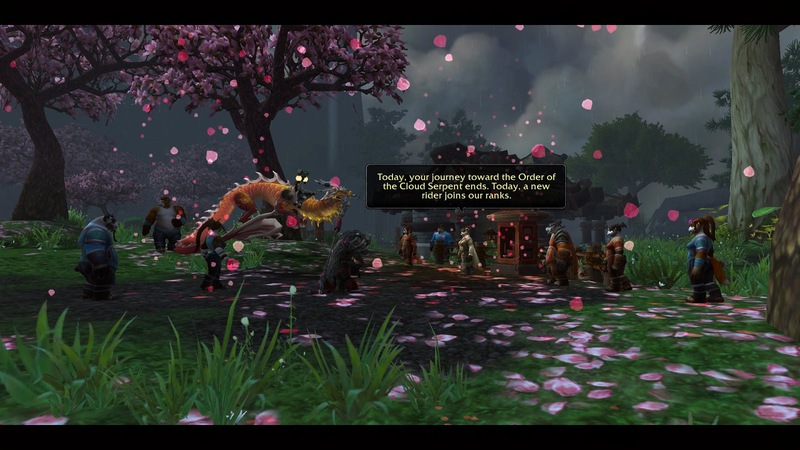 "What just happened," Weipon muttered to herself in Pandaren. She sipped at her drink, surreptitiously looking around at the other patrons in the bar. In doing so, she noticed many of them doing the same thing back at her. A large hand landed soundly on the bar next to her, making Weipon jump. She looked at the newcomer, a reddish-brown furred tauren who was now leaning half over the bar to shout, "Another round for Cow's Night, if you please!" The bartender's good-natured response floated back from across the room, and the tauren straightened with a satisfied smile. She belched, surprising herself, and patted delicately at her chest while muttering, "think I got something on myself there." Then, she noticed Weipon. "Woah! A pandaren! What are you doing here?" Weipon frowned in consternation. "I'm...having a drink. At a tavern. What are you doing here?" The tauren mirrored her expression. "I'm also having a drink at a tavern. With my friends, see?" She gestured to two gray-furred tauren sitting at a nearby table, waving at them as she did so. One, who was wearing a dark brown tabard depicting a rock circle, looked pleasantly confused but waved back. The other, in an eclectic but imposing amalgamation of leather gear, began to laugh hysterically. Turning back to the bar, the tauren leaned over to peer at Weipon's drink. "Watcha got there? Don't suppose you brewed it yourself?" "I bought it here at the tavern," Weipon replied, mouth quirking into a sour expression. "Yanno," the tauren continued conversationally, "you're pretty good at Orcish. I didn't know pandaren could speak Orcish." Without thinking, Weipon snapped, "I learned it in school. I also learned that most tauren learn Orcish for many years and can't even hold a conversation. How did you get to be so good?" The tauren blinked, taken aback. Then, she began to chuckle. "I've been very rude, haven't I. So sorry about that." She placed a hand to her chest. "I'm Akabeko." Weipon mimicked the action. "My name is Weipon." "Nice to meet you...Weapon?" Akabeko attempted the unfamiliar name. "More like 'way-pone,'" Weipon corrected. "You know, you can just call me Wei," Weipon suggested. The bartender brought Akabeko's drinks. "Look sharp," she murmured quietly, "Just saw a few Cadence higherups come in." Akabeko followed her gaze to the door. "Curses! Of all people, Katza?" she muttered. "Gotta run!" She gathered her drinks. "Nice meeting you, Wei!" With that, Weipon's first international acquaintance disappeared back into the sea of faces. I welcome any new traffic from WoW Insider's advertisement! Please be kind to my humble bandwidth! This is a reminder post that this year's Blog Azeroth's ~Furtive Father Winter~ post exchange is underway. The deadline is Dec 15th, so if you have 1) a name, 2) a blog, 3) an email address, and 4) a festive desire to give a post to another blogger, SIGN UP ALREADY! You can do so on the BA forum post, my parent post, or by contacting me privately. So far we have 20 people signed up! This is gonna be so merry! What could be inside? What?!?! Well I guess I won't have to wait long to find out! Oh, it's just a baby cloud serpent! Phew! "Would you like to say anything, Akabeko?" "Yes, thank you for letting me have one of your most culturally prized war mounts to take for joyrides. YOLOOOOO"
Well that's one faction down. How bout that! Elder Shaopai met the party at the Temple of Five Dawns and immediately stepped up to organize the two factions. Both Ji and Aysa were busy with the Horde and Alliance soldiers, respectively, and once again Weipon found herself hovering awkwardly around the edges, looking for something to do. Elder Shaopai noticed her hesitation and pulled her aside. "There's something inside the temple that you might like to see." "Master Shang Xi!" Weipon exclaimed, goggling at the ethereal figure that hovered over the flames. The recently departed pandaren smiled. His voice came quietly to her, as if carried on the wind across a great distance. "I see that you have saved Shen Zin Su. I'm very proud of you, Weipon." "Thank you, Master. But now, the Horde and--"
"Yes, it seems that the cooperation both factions showed here today is not enough to mend their great division. 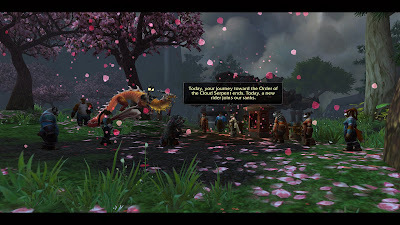 Both Horde and Alliance will need to be returned to their homes, and separately. And..." The spirit leveled a calculating look at his former student. "And, I think some pandaren might join them. Perhaps it's time for the secluded island pandaren to reintegrate ourselves into the outside world." Elder Shaopai jerked. "Master Shang, do you really think the pandaren should leave the Wandering Isle?" Master Shang turned his ethereal gaze on the older pandaren. "Times are changing. We have spent too long learning about the rest of the world in textbooks but never confirming it for ourselves. The pandaren who came to the Wandering Isle centuries ago were explorers. Why can we not be so again now?" Weipon had never had any skill in reading oracle bones, but the instant Master Shang finished speaking she saw a premonition as clearly as if she had read it in the cracks of a tortoise shell still hot from the fire. She saw her path lead her away from the Wandering Isle as surely as if represented by a shattered piece of shell. She realized that Master Shang was watching her. "I will make arrangements with Ji and Aysa. Go and make your final preparations. Return here within five days." Soon after, Weipon was leaving the temple and beginning the relatively short walk to her family's home. Behind her, the activity in the temple kicked into a frenzy as Master Shang's orders were relayed. Behind the stone wall surrounding the family estate, Weipon found her mother tending to the small garden along the sunniest wall. Her pet Fu was napping in a warm patch of grass, but began to bark and zoom wildly around the yard at Weipon's arrival. "Weipon! We've been expecting you for several days! Did something happen at the tournament?" Her mother dusted her hands off and gave her daughter a sweaty hug. She peered intently into the younger pandaren's face and frowned at what she saw there. "What happened?" "Can I tell both of you at once?" Weipon replied faintly. Over what felt like several hours, Weipon related the past few days. The details of the tournament seemed bland in comparison, but Weipon included them for completeness. She tried to downplay the more dangerous situations, but her father still gasped and clucked as he refilled their tea. "...so now, Master Shang is arranging for the Horde and Alliance soldiers to be sent home, and he is recruiting pandaren to go with them." Weipon's mother leaned back with an amazed shake of her head. "Well, thank the spirits that that's over and done with. You must be very glad to be home!" In the awkward silence that followed, Weipon's parents exchanged a glance before turning on her as a team. "You can't possibly be considering going with them!" her mother began, just as her father piped up with, "How can you take over the family business if you're across the ocean?" They talked over each other for several seconds, growing more frustrated, until finally Weipon had a chance to speak. "Please understand that I'm not doing this to hurt you. I can't really explain it, but I feel like I need to do this. 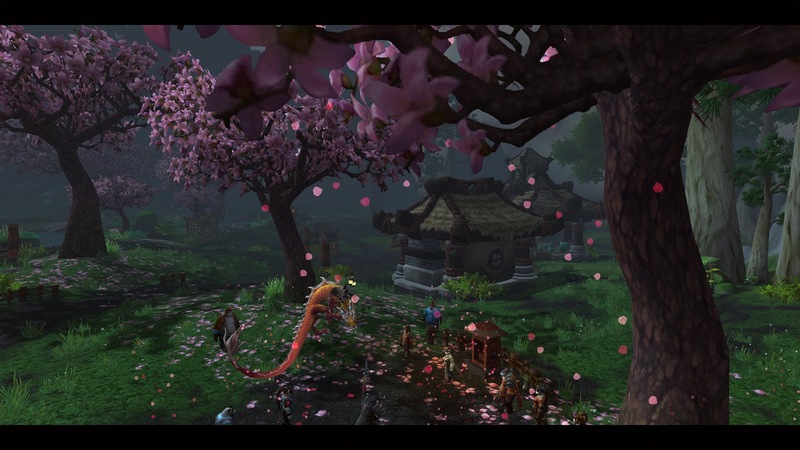 Meeting the other races of Azeroth made me realize that I don't know enough about the rest of the world, and I need to explore it to really understand it." "You've never had any strange tendencies like that growing up, not like that Stormstout cub," her mother cut in. Weipon reined in a grimace. "I don't know what to tell you, other than that I've decided to go. I have five days to spend with you before I leave, and I'd like to make the most of them." The next few days were tense, as Weipon's parents alternated between showering her with frantic affection and passive-aggressively trying to talk her out of her decision. 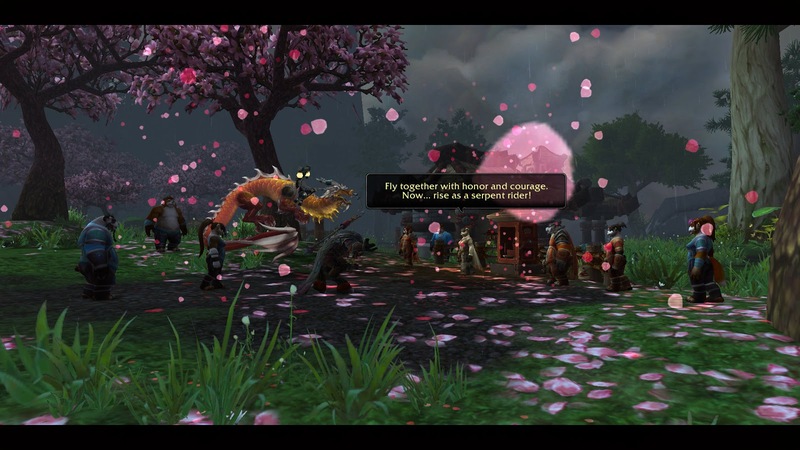 Her father's face grew thunderous when he saw fliers recruiting pandaren for the Horde or the Alliance. Her mother sighed loudly when she saw Weipon's packed bags waiting at the doorway. For her part, Weipon visited friends and neighbors, made last-minute copies of recipes and music, and spent as much time talking to her parents as possible. On the last night before her departure, they sat around a campfire in the yard, sipping wine and admiring the setting sun reflecting off the artificial pond in their garden. Her father stretched and stood with some effort, then went into the house to retrieve something. He returned with his writing materials and spread them out on a folding table. "I'd like to write something...for you to take with you," he said gruffly. But will my beloved daughter too return? With a flourish he signed and stamped his name, then began to meticulously clean up his materials. Weipon's mother slipped away with a murmur, then returned with a small pouch. Weipon swallowed, overcome with emotion, when her mother began to remove treasure after treasure from the pouch. "I'm no poet like your father, but I also wrote something for you." She unfurled a sheet of parchment on which she had simply written "Remembrance." After replacing it in the pouch, she removed a jade comb depicting a serpent rampant inlaid in pearl and gold. Weipon had always admired it, especially when her mother wore it in her long hair. "Now this, as you know, has been passed down through the women of my family for some time, so it's high time it made its way to you. I'll give you the same advice my mother gave me: It's too pretty to be wasted in a drawer somewhere. Enjoy it by wearing it, or you won't enjoy it at all." This too was returned to the pouch. "And finally, these are from your father's side of the family. His mother gave them to me when we married." She showed Weipon two enormous gold disks shaped like half sunbursts, or perhaps golden paws. The centers were lacquered in red. Her mother smiled almost shyly. "I hope that you'll see these things and think of us." "Oh, Mother," Weipon said, "you know I won't forget you!" She surged forward to hug her mother fiercely. When they separated, her father was also holding out a small package. "It's nothing special. I know you already have your own set of brushes but... Well, it's just something new for you." She opened the box to find two new calligraphy brushes and a small ink stick. Her father had carved her name into the handles and added a braided loop to the top for easy hanging. She touched them with trembling fingers, then closed the box. "Thank you.," Weipon told her parents. "You have done nothing but provide for me since I was born, and now as I'm about to selfishly leave you alone you give me even more. I could not ask for anything greater." In the morning, they rose early. Weipon's mother helped her fix the jade comb in her hair, and her father carried her bags to the temple. Weipon carried her sanxian strung across her back, the first few bars to a new piece already floating around her head. They arrived as the sun was just peeking above the horizon and gasped at the hot air balloons being prepared in the temple yard. The only balloons big enough to transport the large amount of soldiers and pandaren across the sea were those typically used in festivals. Here and there brilliant splashes of crimson, emerald, and gold shivered in the early light as the balloons were filled and the baskets prepared for the journey. Designs depicting smiling pandaren faces, auspicious phrases, and playful spirits beamed down on the soon-to-be-travelers. Weipon saw Ji standing with a group of tauren by one of her favorite balloons. She turned to her parents. Silently, they embraced. Then, with a wry grin, her father bowed, followed closely by her mother. Weipon swallowed hard and returned the gesture. She waved to their parting backs, then went to find something to do to distract her. Ji was glad for the extra pair of hands. "We're hoping to release the first balloon within the hour. Did you decide if you're coming with me or, um...Aysa?" he asked with false brightness. "You, of course. I think the Huojin is the only way for me to go." She shrugged. He smiled. "Well, I'm glad to have you on board." He showed her where to store her belongings and set her to loading more packages onto the balloons assigned to the Horde group. As the sun rose, so did the number of people milling about, waiting for the events to start. Elder Shaopai began to rustle his parchment, indicating that he would like to give his speech, and the rabble gradually gathered into their assigned groups and quieted. Weipon hardly heard the speech, so intently was she focusing on the gently undulating basket waiting for her. Then, Ji was helping her step up, and a group of half Horde soldiers, half pandaren volunteers filed in behind her. 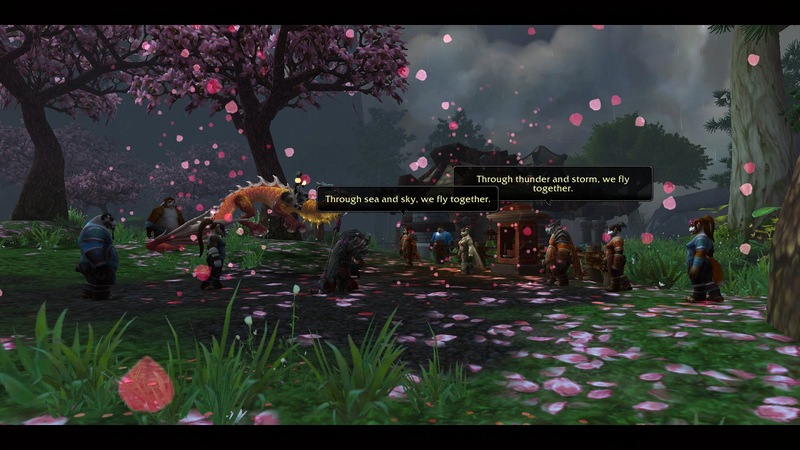 Expertly, Ji and another pandaren began to maneuver the balloon, sending it higher and directing it towards where they estimated Kalimdor to be based on Shen Zin Su's migration. The balloon floated up, finally rising above the highest spire of the temple. Weipon was startled to hear a familiar barking. "Hey, a little...what is that, anyway?" an orc cried, peering at a corner of the basket. Fu looked up expectantly at Weipon, wagging his tail in excitement. "You...can't be here," Weipon said dumbly. "How did you even get out of the yard?" "Is this little fella yours?" Ji asked. He gave Fu's ruff a friendly scratch. "I guess it's too late to take him back. Unless we toss him overboard, but he'd probably just swim along behind us." He smiled ruefully. Weipon was relieved to hear that Fu would not be tossed into the ocean. And so, the freshly expanded Horde (plus one stowaway dog) set off for Kalimdor, crossing the sea in a whimsically colorful parade. Happy December! 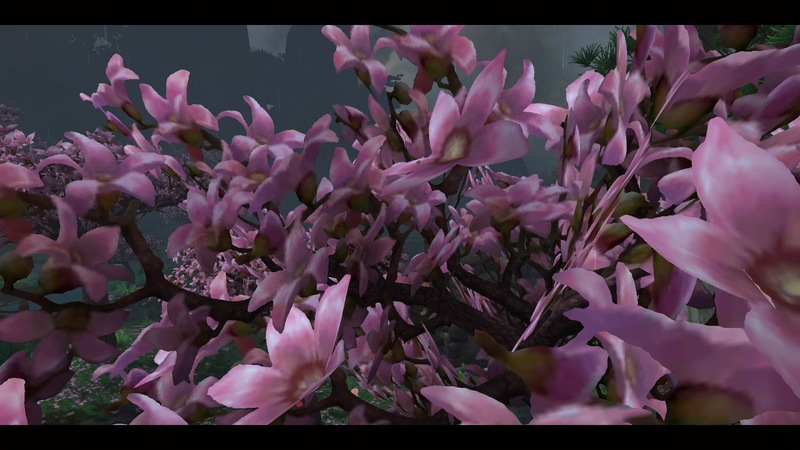 The icy tendrils of winter are stealing across Azeroth, and its peoples turn their faces towards the distant spring. Those of us on Earth are bundling up and settling in for a long winter's grindfest. Once again, it's time for the 4th annual Blog Azeroth Furtive Father Winter blogger gift exchange! Bloggers are encouraged to sign up, create a post for their randomly-assigned gift recipient, and publish the gift they receive from their furtive Father Winter! You don't need to be a BA member (although I highly recommend it), but you do need a place to publish gifts. 1. 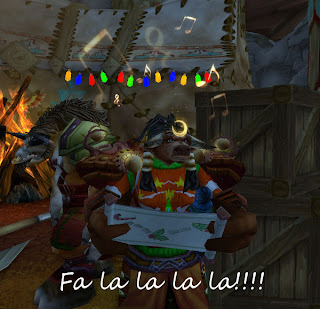 Between now and December 15th, email me using my comment form, reply to this post, or reply to the Blog Azeroth FFW thread. I need your name, email address, and blog URL. 2. On December 16th, I will pair up participants and email everyone with the name, email address, and blog URL of their gift recipient. 3. Gift givers should then learn about their recipient and create a gift post using prose, poetry, music, graphic art, screenshots, or anything else that inspires them. There is no quantity requirement; just make sure it's something you might like to receive as a present! 4. Between December 20th and 31st, please deliver your gift, and publish what you receive on your blog. Be sure to credit the gift-giver so we can appreciate all the creativity! Last year we had a really incredible turnout, and everyone turned in wonderful posts by the deadline. To keep it going, feel free to nab the graphic and link to this event on your own blog or twitter. The more the merrier! Weipon coughed, clambering to her feet and waving smoke out of her face. Many of the soldiers were already up and moving. She rushed forward to meet Aysa and Ji, who were already surveying the results of Ji's plan. She stifled a moan. The ship had been successfully dislodged from Shen Zin Su's side, leaving behind a seemingly endless gush of fresh, bright blood. Somehow, more saurok were pouring onto the beach. Everywhere, both Horde and Alliance soldiers were leaping into action. Aysa turned to Ji, "Look at what you've done!" she shouted. "He is dying, Ji!" "His wounds can be healed!" Ji countered. He took a step in order to punch a saurok in the jaw, sending it flying back into the fray. 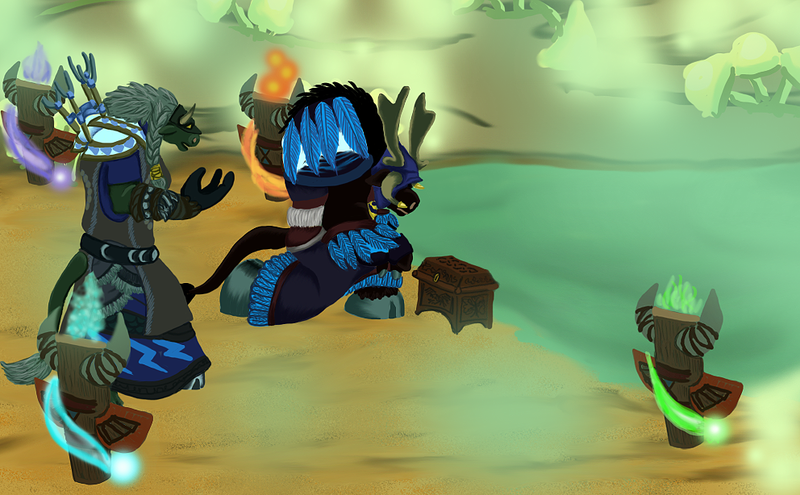 At that moment, Shen Zin Su positively roared, sending them all to their knees as the island rippled in agony. "I hope you can forgive yourself for what you've done to him," Aysa replied thickly. She moved to join the throng of healers that were clustering at the red lip of the wound and pouring spells into the exposed flesh. Ji swallowed, cheeks twitching with the effort not to call out to her. He spun to Weipon instead. "Keep those saurok off the healers!" She nodded and hastened to help. A pair of saurok were hassling a thin, willowy human wearing nothing more protective than a cloth robe. His hands glowed brightly, and it seemed that a shimmery, transparent bubble was protecting him from the worst of the attacks. Weipon dispatched one of the saurok with a flying kick to the neck, then jabbed a knuckle into the other's kidney. It grunted, distracted from its squishier prey, and turned to deal with the new threat. At that moment, an enormous cat leaped at it from behind, raking it from shoulder to hamstring. The saurok crumpled into a heap, and Weipon couldn't stop the tiny shriek as the cat turned its round, intelligent eyes on her. Then, the cat began to flow liquidly upward, finally resolving into the shape of a troll. "Come! Go!" she urged the human in heavily-accented Common, shouting around the two enormous tusks protruding from her mouth. Tiny leaves were already sprouting at her feet and being drawn upward as she gathered her power. Clamping down her amazement, Weipon looked for another opponent. It was hard to keep track of the healing effort in the panic of each fight to the death, but after some breathless minutes Weipon found that her seeking fists found nothing left to fight. Half-dizzy with adrenalin, she sought out the angry wound, hoping that somehow Ji had managed to pull it off. Already, it looked better than it had. The hemorrhaging had stopped, and a thin layer of tender pink skin covered where the ship had pierced the shell. Before Weipon's eyes, the skin darkened and thickened, and now the wound looked weeks old instead of merely hours. Then, she watched in half-disgust as the broken shell began to slowly, agonizingly knit back together. Closer to the beach, a human priest faltered, slumping in exhaustion. Then, an enormous, furred hand closed around her neck, as a tauren nearly twice her size propped her up and channeled rejuvenating magic into her. Silently, Ji joined her, eyes as round as the other spectators'. "It's working," he said, with more than a little disbelief. The shell finally reformed, hardening and darkening into a simple patch of discolored dirt. There was a collective sigh of relief. Everywhere, healers were collapsing, sitting down where they were or, in the case of one hunched troll, fainting straight away into the unsuspecting night elf next to him. Weipon noticed that where the druids had stood, saplings were pushing through the new soil, shooting up to full height and blooming leaves in crimson and burgundy. "That was amazing," Ji murmured, passing a shaking hand over his heart. Weipon picked Korga Strongmane out of those rushing to aid the healers. He was currently glaring down his nose at the stoic Delora Lionheart. Ji followed her gaze, muttered "wuh oh," and rushed over to stave off the coming confrontation. "...don't push me, human," Korga finished with a derisive snort. Delora raised her chin. "Stand down, tauren, before I put you back in chains." "Now, now, let's not do anything we might regret," Ji began, rushing to stand beside Korga. Aysa came up to meet Delora at the same moment. "That's rich, coming from you," she replied with a grimace. He opened his mouth to argue, then thought better of it. "What's important is that Shen Zin Su is no longer in danger, and we can turn to the much happier matter of seeing everyone off to where they need to be. I propose we all reconvene at the Temple of Five Dawns to discuss this. Also, I could really use a solid meal." After a long, deliberate pause, Aysa replied, "That would be acceptable." The pair broke apart, Ji and Korga rounding up the Horde ex-prisoners while Aysa and Delora commanded the Alliance soldiers. Weipon stood, frozen in the middle, suddenly unable to think over the roaring in her ears. Finally, she was shaken from her confusion by a heavy hand on her shoulder. A tauren was saying something, but she couldn't focus. The tauren peered into Weipon's face, nodded in recognition at what she saw there, and did something that made Weipon feel both chillingly refreshed and incredibly relaxed. "Why don't you ride this cart back to the temple," the tauren said, kindly sitting Weipon down on the back of a supply cart. "You're bushed." Weipon nodded dumbly, but the tauren was already attending to other things. Quietly, she mumbled, "What's 'bushed'?"